Young South Africans reflect on the Synod and call for "an IMBISA Youth Day"
Johannesburg (Agenzia Fides) - "Too many migrants are exploited, especially those migrants and refugees who do not have proper documents", said His Exc. Mgr. Buti Tlhagale, Archbishop of Johannesburg, in his speech for the celebrations in South Africa for the 50th Anniversary of the Symposium of the Episcopal Conferences of Africa and Madagascar (SECAM), held in Durban. Referring to undocumented migrants living in South Africa, the Archbishop said: "Many receive slave wages and are continuously threatened with arrest. Some are victims of corrupt police officials. And, as if that was not enough, many have been victims of xenophobia. 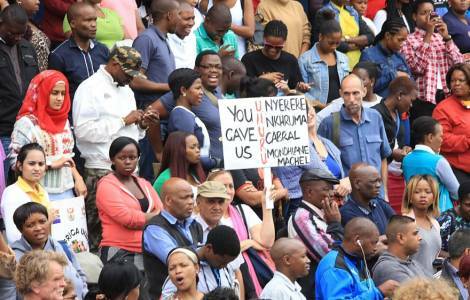 When local communities go on a service delivery protest, they take out their anger on foreign nationals. They harass them, attack them, destroy and loot their shops. It is most unfair for migrants and refugees to be made scapegoats for the glaring shortcomings of the government and local authorities", he underlines. Mgr. Tlhagale acknowledges that there is a crime problem linked to migration that exacerbates the minds of the population and risks criminalizing all the members of the foreign communities present in South Africa. Among the migrants "there are those who are heavily involved in drug trafficking", says Mgr. Tlhagale. "Drugs have become a scourge in some of our communities. Thus the palpable anger of the communities is understandable. There are those migrants who are involved in robberies and human trafficking. These aberrations by some should not lead to the wholesale condemnation of the entire community of migrants and refugees", warns Mgr. Tlhagale.